The foods I miss a lot about CA is sushi, taco truck, and ramen. Not necessary in any order. But I love them so much. It is hard to get good sushi here in restaurants. We tried a few and the fish that were severed looked like they died went to heaven and came back and died again. 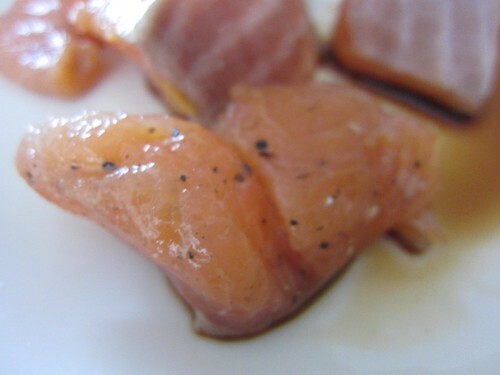 So imaging my happiness when I saw a recipe for curing salmon! 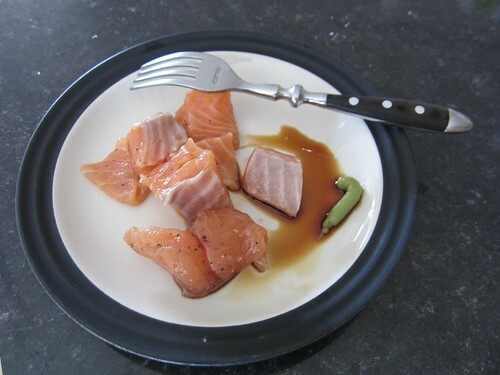 Salmon is very very good here, but like everyone I am afraid of catching a new best friend by eating it raw. This is like the best of 2 worlds and so easy to do too! And this deliciousness is what you end up with! 3 large tablespoon Maldon sea salt – Hunt this down if you have to it’s the best salt ever. 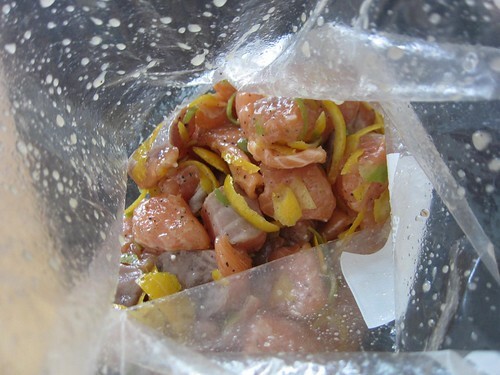 Get a big ziplock bag and chuck in the salt, sugar, lime, lemon, orange zest. Shake it and mix it well. Cut up the salmon fillets in bite size chunks. Shake until everything is mixed. After it’ll look something like this. When you are ready to eat these meaty goodness, rinse them off (to get the slime and zests of) and dry them with a tea towel or whatever paper towel you got on hand. Put everything back in the refrigerator until you are ready to eat them. Purees the avocados with lime juice, wasabi, and season with salt and pepper. Smear it on a plate. Mix it all together and put it in a bowl. Eat until you can’t eat no more!